Originally a British Colony, Grenada became an independent country in 1974 and voted for its first prime minister, Eric Gairy, in 1976. Unfortunately, opposing political parties did not accept the result of the elections, and Gairy was overthrown in 1979. The unfolding civil unrest led to the United States invading of the country in 1983, withdrawing by the end of that year. However, while Gairy was in office, he publicly expressed many unusual opinions, including his view that aliens were about to invade the Earth, as evidenced by the many UFO sightings around the world. Using his seat at the United Nations as a vehicle, he called for the creation of a special United Nations Task Force to investigate UFO reports. 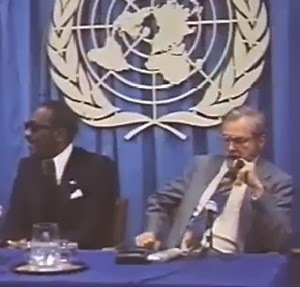 Amazingly, UN Secretary U Thant agreed to hold a UFO Conference at the UN, at which Gairy hosted a press conference and heard presentations by major UFO experts. A clip of the UN UFO hearing in 1978 can be found here. Unfortunately, it was while Gairy was attending the presentations in New York that a coup took place in Grenada. In 1978, Grenada issued a set of stamps commemorating Gairy's presentations at the 32nd Regular Session of the General Assembly of the United Nations in 1977. It's time to start thinking about the best Canadian UFO cases of 2013. Ashley is hard at work entering the 2013 UFO case data (poor thing!) and some interesting reports are falling out of the year's mix. One of the best cases, in my opinion, happened on January 8, 2013, in Nova Scotia, not far from Halifax. Two young children had a close encounter with a large bright object that scared them and made them their their parents. It was reported and investigated by the RCMP, and then referred to me. My blog post on it is here. And the CBC's news report of the incident is here (at about 1:35). The other good cases of 2013?